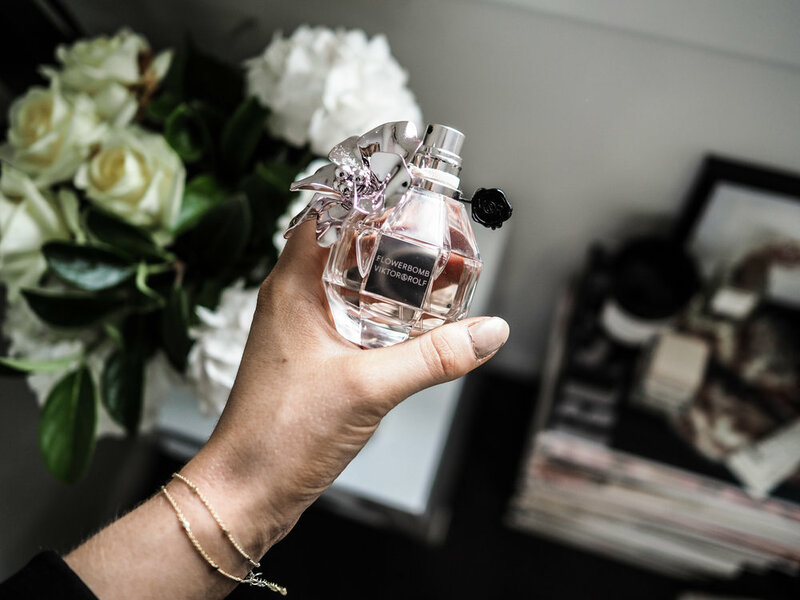 Fresh, floral and with a hidden scent of musk is the best way to describe Viktor & Rolf's Flowerbomb. I am definitely not one for super floral fragrances, I often find them far too overwhelming but I really love the notes of patchouli in this fragrance which allow for the musky aroma. I found the above print at a market in Montmarte, Paris from a disgruntled French man who probably found it absurd that I would be willing to pay for such a simple print - but nonetheless it was exactly the kind of print I wanted. 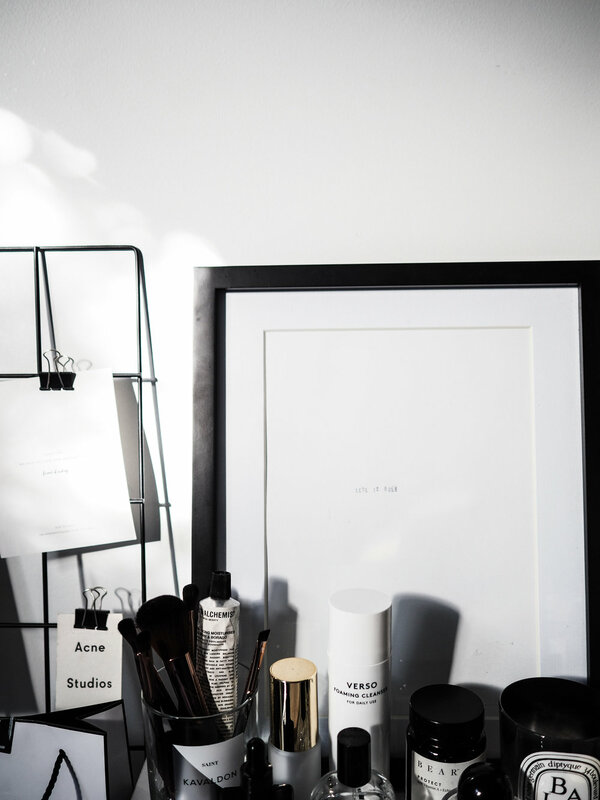 If you've read any of my beauty posts you'll know I definitely follow a 'less is more' approach to my beauty routine, I prefer to focus on quality not quantity - as with many aspects of my material life. I also believe that when it comes to makeup, it is as much about your skincare regime as it is your makeup regime. That's why I am so particular when trying new products as I love my current regime but am happy to try something new if it is going to live up to the reviews. Aside from my usual beauty regime I've also been trying out edit's from Maslow & Co, which is a monthly subscription beauty box that features monthly editions of products from different countries. This month's was a French inspired box that has the most beautiful scent of lavender when you open it, and as per usual there was no disappointment in the quality of the products. Of course there were a few that stood out to me, but within this edit I loved everything even the addition of the Apsu Travel Candle which has the most beautiful rose and jasmine scent. Some of the products I am already familiar with hence they integrated seamlessly into my usual beauty regime. Products like the Nuxe Nuxellence Éclat Serum has been something I have wanted to try for a long time, especially since I am such a fan of their Prodigieuse Oil (which is the most nourishing body oil and smells amazing) so I knew the product would be quality. It's perfect for adding into your daily routine to give your skin a natural glow and dewy look to foundation, it's smooth to apply and for me gets rid of any dullness in my complexion - not so much any redness but definitely gives my skin a fresher look. Another favourite of mine is the Nominoe Radiant Hydration Mask which is so perfect for a radiant complexion, and of course there's nothing better than Sunday night mask rituals. As part of my normal skincare routine I use Verso Skincare's Foaming Cleanser, I've used this for so long and am yet to find anything that comes close to the quality or effects. Before I started using this cleanser I used to have constant breakouts now (along with ensuring I drink 2L of water a day and a green tea every morning, trust me it is essential to good skin) I only get one or two hormonal spots but nothing like before. It has completely cleared up any small bumps that I used to get along my T-zone yet my skin is always so hydrated. My routine consists of scrubbing off any makeup or grime with an exfoliator soap just like the Laboratories Surface-Paris Bright Now Gentle Exfoliating Soap before using my cleanser. This may sound a bit pedantic but I prefer to remove any makeup or grime from the day with an exfoliating soap in order to allow my cleanser to do the best job possible. I also use a Micella Water, the Bioderma Sensibo H20, to really remove all my makeup - especially after a day where I have done more than my usual regime. I prefer the Bioderma Micella Water because it isn't as harsh as any other brands I've used before yet is still effective, I tend to alternate between an exfoliating soap and a Micella Water but I do prefer to the way my skin feels after exfoliating, so soft and fresh. Other products within the edit include the La Roche-Posay LIPIKAR Cleansing Oil, Institut Karite Paris Almond and Honey Hand Cream or Cherry Blossom Hand Cream and Insitut Karite Paris Macaron Hand Soap which can be purchased on the Maslow and Co website as unfortunately for now the French Beauty Edit has sold out! I do have good news though, anyone that uses the code BASIS when subscribing to a bimonthly beauty box will receive two products from the sold out French Edit for free - the Bioderema Micellar Water and Nuxe Nuxellence Serum (until they run out). Like most things in the modern world, there's constant change and innovation within the beauty industry. As with most aspects of my basis of style, beauty falls again into the category of less is more or moreso less is more than enough.